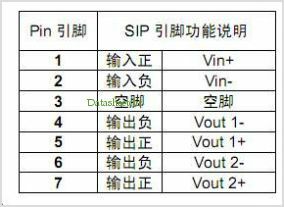 YUAN DC-DC CONVERTER D 系列 DXXXXS(D)-1W/2W 定压输入非稳压 1KVAC双隔离双回路输出 SIP7/DIP14脚封装 By Shenzhen Sunyuan Technology Co., Ltd. This is one package pinout of D050505S-W5,If you need more pinouts please download D050505S-W5's pdf datasheet. This is one application circuit of D050505S-W5,If you need more circuits,please download D050505S-W5's pdf datasheet.